Bare spots in your lawn can seem to appear out of nowhere. They’re hard on the eyes, and unless repaired, they may continue to grow. The good news is it’s easy to restore that bare spot so that it’s not even noticeable. But before you can repair, you first need to determine its cause. If heavy foot traffic is rubbing your grass raw, consider re-routing the traffic by installing stepping stones or a pathway. If the bare spot came from disease or insects, treat the specific cause before making repairs. 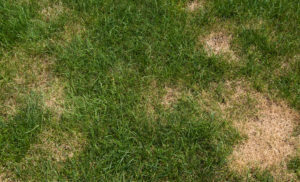 If your lawn has some bare spots, determine the cause to prevent it from happening again. Remove debris/dead grass. Clear out the area so you can get in for repairs. Break up the soil. Use a hard-toothed lawn rake or a garden cultivator to remove at least a couple inches of soil. If the bare spot was caused by a chemical such as gasoline or an herbicide, clear a couple more inches. Add clean topsoil or compost. It will help your newly installed turf grow more productively. Use the top edge of the rake to even out the level of new soil or compost with the rest of the lawn. Lay the new turf. The new grass should settle right into the clean soil and take hold. Once you patch your grass, be sure to water it well in order to support healthy root growth. Water well. Get out early in the morning and evening every day. Keeping the soil moist enables the fresh turf’s roots to grow into the soil. Fertilize. Consider a selective, pre-emergent weed control fertilizer to discourage weed growth while the grass grows. If you are growing your lawn organically, use good compost or organic fertilizer. Avoid fixing bare patches during drought or stress conditions. Try to time the repairs when the weather is conducive to growth. The best time to fix warm-season grasses is late spring; for cool-season grass, try to do repairs in the early fall. After a couple mowings, the repaired patch should blend in with the rest of your lawn. What kind of grass seed is best for Idaho and what’s the best fertilizer? The best kind of seed to use in Idaho is a Bluegrass blend. You can find the right blend at your local Home Depot or Lowe’s. This time of the year I would use Scotts “Fall Fertilizer” which is lower in nitrogen and is designed to develop root structure as your grass goes into dormancy; This fertilizer can be at your local Home Depot or Lowe’s as well.